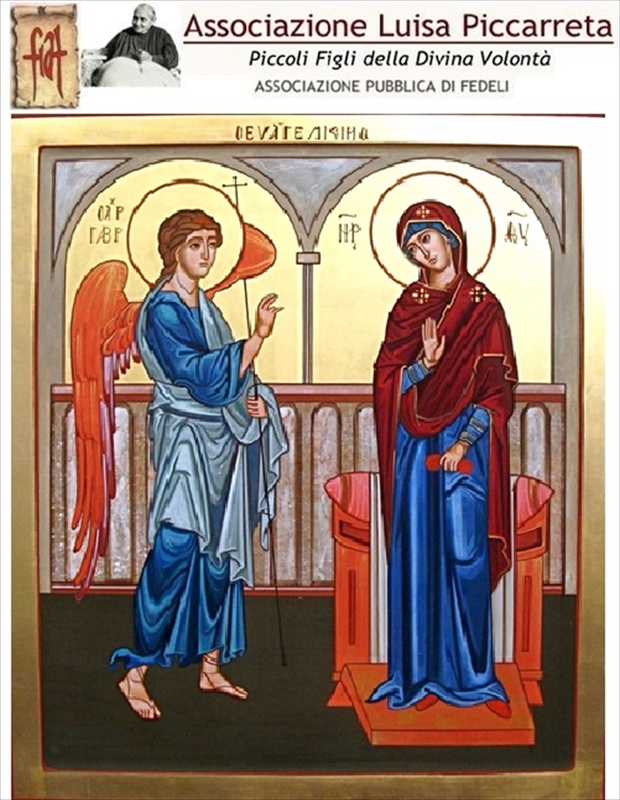 Despite her very young age, according to the tradition of the people of Israel, Mary was already betrothed to a man of the house of David named Joseph, a God-fearing man, who filled her with attentions and respect. Even though Mary and Joseph did not live together and their marriage had not yet been celebrated, there was already a strong bond of respect and affection between them. Mary dreamed of marrying Joseph; She dreamed of a better future for herself and the family that they would build together. She hoped for a peaceful life, comforted by many children who were living signs of the blessing of the God of Israel. The Lord does not look at our values, wealth, social position, culture: all this in His eyes counts for nothing. Each of us is worth for what he is, for his own essence. God only cares about the authenticity of our faith, because when it is true, it is easily incarnated in everyday life; it becomes a vital spirit that gives strength and meaning to every little gesture, to the most ordinary and banal choices. True faith is never estranged from the time in which we are called to wander, but it is responsible for the reality of the world to transform it and make it conform to the revealed Word that was given to us. We too, like Mary of Nazareth, have our projects, our dreams. Thinking and believing in something great, projecting ourselves into the future by imagining what we would like to do or be, makes our present beautiful and gratifying. What we are, our identity as women and men is the result of the environment in which we are born and grow, it is the result of the experiences we mature, of our decisions. Each of us is unique, in time and in history there will never be another person equal to us. If this is a certainty that we can reach simply with the instruments of rationality of which we are gifted, the moment we enter into relationship with the Lord we reach a further awareness: we are special in the eyes of God and our existence is the consequence of His Will. Before God each of us has a precise identity and through our concrete living, if we want it, we can realize a piece of His project of life and freedom. It is necessary, however, to place ourselves in the presence of the Lord, to listen to His voice that speaks to us in prayer and through the Scriptures and therefore to follow Him. On July 11, 1923, in her diary, Luisa reported an important teaching of Jesus that makes us understand how the greater the work God wants to do, the more necessary it is that the creature He chooses be unique and singular. The work of Redemption was the greatest, and He chose only one creature, endowing Her with all gifts, never conceded to anyone, so that this creature might contain so much grace as to be able to become Jesus’ Mother, and so that He might deposit in Her all the goods of Redemption. And in order to keep His own gifts safe, from the moment She was conceived until She conceived Jesus, God kept Her overshadowed within the light of the Most Holy Trinity, which became Her custodian and held the office of directing Her in everything. Then, when Jesus was conceived in Her virginal womb, He being the true Priest and the head and the first of all priests, He Himself took on the charge of keeping Her and directing Her in everything, even in the motion of Her heartbeat. And when Jesus died, He entrusted Her to another priest, who was Saint John. A soul so privileged, who contained all graces, unique in the divine mind, unique in history – He did not want to leave Her without the assistance of a representative of His up to Her last breath. Jesus did this with Luisa. She too is unique in God’s mind, and will also be unique in history; and there will not be, either before or after her, another creature for whom God will dispose, as though forced by necessity, the assistance of His ministers. Having chosen her in order to deposit in her the sanctity, the goods, the effects, the attitude, of the Supreme Will, it was appropriate, just, decorous, for the very sanctity that the Divine Will contains, that a minister of God should assist her and be the first depository of the goods which the Divine Will contains, so as to let them pass from his lap into the whole body of the Church. What great attention is required of her, and of them: of Luisa, in receiving from Jesus, like a second mother to Him, the great gift of the Divine Will, and in knowing all Its qualities; of them, by receiving them from Luisa, so that the ‘Fiat Voluntas Tua on earth as It is in Heaven’ may be fulfilled in the Church. To deposit the Divine Will in Luisa. Jesus removed from her any seed of corruption; He purified her soul, her very nature, in such a way that neither does she feel anything for them, nor do they for her, because, since the seed is missing, it is as if fire were missing to firewood. And even though Jesus did not exempt her from original sin, as He did with His dear Mother, by removing from her the seed of corruption He worked another prodigy of grace, never conceded to anyone else, because it was not decorous for the Divine Will, trice holy, to descend into and take possession of a soul which would be shaded, even slightly, by the slightest corrupted breath. The Divine Will would not have adapted Itself to taking possession of her, to communicating Its attitude to her, had It seen any seed of corruption in her, just as He, Word of the Father, would not have adapted Himself to being conceived in the womb of the Celestial Mama, had He not exempted Her from original sin. The fulfillment of the Divine Will is so great as to be numbered among the greatest works which the Divinity operated. And Jesus wants It to be known, so that in knowing Its greatness and the immense goods It contains, they may love It, esteem It and desire It. Three times did the Supreme Divinity decide to operate ‘ad extra’. The first was in Creation, and it was without the intervention of the creature, since none of them had yet come out to the light of the day. The second was in Redemption, and with It intervened a woman, the holiest, the most beautiful – His Celestial Mother. She was the channel and the instrument Jesus used in order to fulfill the work of Redemption. The third is the fulfillment of the Divine Will to be done on earth as It is in Heaven – that is, for the creature to live and operate with the sanctity and the power of Our Will; a work inseparable from Creation and Redemption, just as the Sacrosanct Trinity is inseparable. This is not about just anything – this is about divine decrees, and about giving God the field to let Him accomplish the work of Creation and Redemption. Therefore, just as God entrusted Our Celestial Mother to St. John, that She might deposit in him, and from him into the Church, the treasures, the graces and all of Jesus’ teachings so He wants to do with Luisa: since the ‘Fiat Voluntas Tua’ must serve the whole Church, He entrusted her to a minister of His, that she might deposit in him everything He manifested to her about His Will – the goods contained in It, how the creature must enter into It, and how the Paternal Goodness wants to open another era of grace, placing His goods, which He possesses in Heaven, in common with the creature, and giving back to her the lost happiness.